Founded by Ivan T. Sanderson, the man who coined the term "cryptozoology," the Society for the Investigation of the Unexplained was established as a non-profit organization in 1965. Its purpose was "...the acquisition, investigation and dissemination of information on reports of all tangible items in the fields of chemistry, astronomy, geology, biology and anthropology, that are not readily explained." The Society for the Investigation of the Unexplained published its findings on investigations into the anomalous in its unscheduled quarterly, Pursuit Journal (of the Society of the Unexplained). Their research board included at least a dozen, noted scientists of various fields. The Pursuit Journal only lasted a few years. Sanderson died in 1973, and the organization originally disbanded in the 1980s. A Society for the Investigation of the Unexplained apparently exists in Baltimore, but its statement of purpose is quite different, and may not be connected to Sanderson's. Ivan Sanderson published numerous books and articles under two different names regarding a diverse number of subjects, and was considered skeptical of the paranormal. One researcher posted that a cache of SITU materials had been discovered, but little information has since come to light. Ivan Sanderson coined the term "cryptozoology." Shortly after Ivan Sanderson's death (from Cancer? 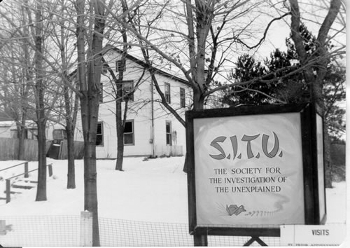 ), S.I.T.U's "headquarters" moved from Columbia, New Jersey to Little Silver, New Jersey, a very affluent area. It seemed a young, competent man there had somehow legally gained control of the Society and Pursuit. He was intelligent and approachable, BUT HE HELD A TIGHT, LIMITING PERSONAL CONTROL over what he had "inherited?" This proved to be quite discouraging -- and a turn-off -- to me, and perhaps to others as well. Sorry, Zigstone. Blogger apparently had some issues with Comment Moderation (this is not the only blog that was affected), and your posts literally just came through today. Thank you for your comments.